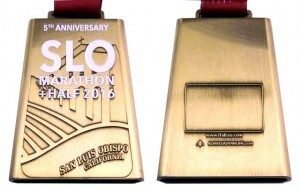 SAN LUIS OBISPO, Calif. — (March 10, 2016) — The San Luis Obispo Marathon, Half Marathon + 5K presented by LeftLaneSports.com has released a collectible finisher medal for its 5th anniversary event edition. Since its inaugural year in 2012, the event has given real cowbell medals to the top male and female finishers, celebrating San Luis Obispo’s rich farming culture. All finishers in the Marathon and Half Marathon will receive this unique, exclusive ringing cowbell medal. The San Luis Obispo running tradition produced by Race SLO, the Central Coast’s largest running event with 4,000 participants, will be held on April 30-May 1 in Endurance Town USA. “Our 5th anniversary cowbell medal is truly something special, and Always Advancing created this beautiful, collectible medal that we look forward to presenting to all our Marathon and Half Marathon finishers as a reward for their dedication, hard work and achievement. This year’s theme of ‘MORE COWBELL’ was chosen to exemplify the pure joy and pride our Race SLO community has for this annual family fitness weekend of races,” said Samantha Pruitt, Race SLO Founder & CEO. Established in 2010 to bring world class sporting events to the beautiful California Central Coast, the Race SLO family of annual events includes the 5th SLO Marathon + Half and Family Fitness 5K (Spring 2016), SLO GranFondo cycling event (Fall 2016) and the inaugural SLO Ultra trail races at Wild Cherry Canyon (Fall 2016).